I am so happy that I learned how to make tiramisu cheesecake recipes. Although most do not refer to this very delicious dessert as cheesecake, most of the time it is made with Italian cream cheese. Occasionally, I have had it with no cheese in it at all; only whipped cream. To me that is not “tiramisu” and certainly not cheesecake. This luscious Italian dessert is layered with coffee soaked cake and a sweet mixture of cheese, eggs, sugar and Marsala. Some people leave out the Marsala or use another type of alcohol. The traditional sponge cake used are the “ladyfingers” or in Italian “Savoiardi” biscuits. These are soaked with a strong coffee or espresso. The traditional cheese is a creamy mascarpone cheese. 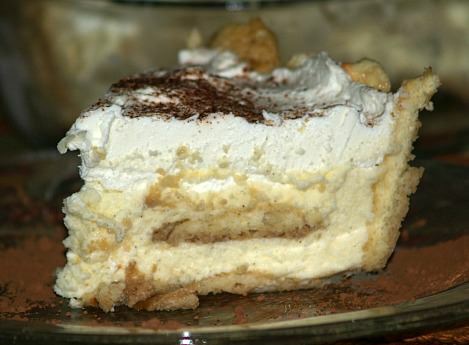 Like I said there can be many variations but if you are learning how to make tiramisu cheesecake recipes the traditional version is absolutely fantastic! Now a little about this wonderful Italian mascarpone cheese. You can substitute this cheese with others like Neufchatel or other cream cheese; some say the mascarpone is too expensive. As I often state, when I go to the trouble of preparing a recipe I want it to be just right. 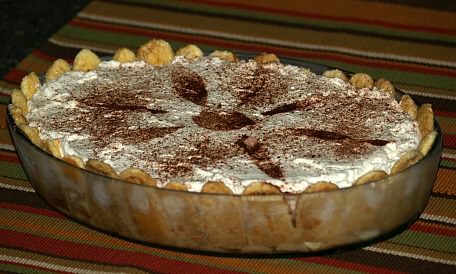 I love the light creaminess of this cheese and I feel it is a necessity if you are learning how to make tiramisu cheesecake recipe; it is worth the money. Some choose to make their own mascarpone cheese recipe at home and claim it is not hard to do, is very tasty and much cheaper than purchasing it. Stir together 2/3 cup sugar, 2 cups whipping cream, 2 eggs, 2 egg yolks, flour and vanilla bean in a heavy saucepan. Cook over medium heat stirring constantly 20 minutes or until thickened. Cool mixture completely; discard vanilla bean. Combine and beat together mascarpone cheese and cream cheese. Add cooked mixture to the cheese mixture; blend well. Stir together espresso and Marsala. Dip each lady finger in coffee mixture and layer in 9 X 13 inch baking dish. Pour mascarpone mixture over the ladyfingers. Beat remaining 1 cup whipping cream at high speed until foamy. Gradually add powdered sugar beating to “stiff” peaks. Spread over mascarpone mixture and sift cocoa powder over the top. NOTE: To make espresso stir together 1 cup hot water and ½ cup ground espresso coffee. Let stand 5 minutes; pour through a wire mesh strainer lined with a coffee filter into a glass measuring cup; discard grounds. Beat egg whites with ½ teaspoon sugar until fluffy with soft peaks. Whisk egg yolks, 1/3 cup sugar, vanilla and 1 tablespoon espresso coffee until smooth. Add mascarpone cheese to egg yolk mixture and mix. Fold in beaten egg whites gradually. Dip ladyfingers into reserved espresso; layer in bottom and sides of small loaf pan. Cover ladyfingers with ½ of mascarpone mixture, grated chocolate and sprinkle with cocoa powder. Add another layer of dipped ladyfingers, cheese mixture, grated chocolate and cocoa powder. Cover with plastic wrap; chill at least 4 hours. Slice to serve to serve. NOTE: Chilled loaf can be removed from pan and frosted with whipped cream; then slice. This is reduced fat recipe. In large mixing bowl combine sour cream, cream cheese, sugar, milk and vanilla; beat until smooth. Combine coffee and coffee liqueur. Layer 1 package ladyfingers, cut side up in 2 quart rectangular baking dish. Brush ladyfingers with half of coffee mixture. Spread with half of the cheese mixture. Repeat with remaining ladyfingers, coffee mixture and cheese mixture. Sprinkle with sifted cocoa powder; cover and refrigerate for 4 to 24 hours. Cut in squares to serve. 2 Packages (3 ounces each) ladyfingers. Beat cream cheese and sugar in mixing bowl until light; blend in Marsala and vanilla. Fold whipped cream into cheese mixture. Combine coffee and amaretto in a small bowl. Split ladyfingers in half; place 4 halves in each of 8 footed dessert or wine glasses. Drizzle ladyfingers with coffee mixture. Top each with ¼ cup creamed mixture and several teaspoons of Heath bits. Repeat with 2 more layers ending with Heath bits.